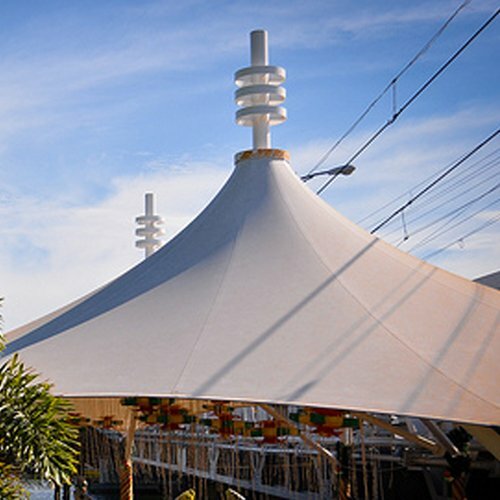 StructureTec Blockout 22 (JSTBO22) is a premium knife coated vinyl used as a tensile structure fabric that is produced with the necessary fire retardant treatments to meet NFPA-701. StructureTec 22 is built with a blockout to eliminate the transmission of light, giving your structures the lighting control needed to create the ultimate environment. This tensile structure fabric has a lacquered topcoat to allow for easy maintenance and is built with great strength properties to ensure your product will withstand adverse weather conditions. StructureTec Blockout 22 is stocked in a 98.5″ width. Available in 126″ for special orders. Up to 5 yrs, limited.